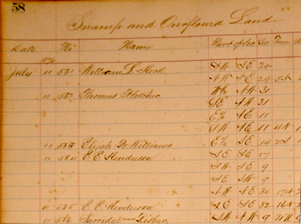 The puzzlement of The Legal Genealogist over the migration of an ancestor from Alabama to Arkansas between 1850 and 1860 led to some research being done by readers, and some suggestions being offered. And one in particular needs some more attention. And, of course, one question we always have with a move like that is: why? What was the pull of the new area to entice settlers to come there? So it probably wasn’t land in this case, or at least not land alone. But in looking at the possibilities, reader Brian Swann noted that there was a development in land around that time that anyone considering the push and pull of ancestral migration ought to consider. It was the original “Drain the Swamp” effort. The Swamp Acts of 1849-1850. So there were other land acts beyond the ones we usually think of — like the Homestead Act — that might have impacted an ancestor and gotten him to go from one place to another. Which raises the question: how do you know if the Swamp Land Act influenced an ancestor to move to Arkansas? So was Boston drawn by this statute? I don’t think so: his land appears to have been outside of the swamp zone and an ordinary cash sale from the federal government, not swamp land donated by the feds to the state and then drained and sold by the state. But it’s sure something to keep in mind whenever the question comes up: why did an ancestor move? Look to the laws… and the land. Swamp land sales are usually under the Secretary of State for the state of interest. I know Alabama, Arkansas, California, Florida, Illinois, Indiana, Iowa, Louisiana, Michigan, Minnesota, Mississippi, Missouri, Ohio, Oregon, and Wisconsin were involved. There were many interesting scandals associated with swamp land sales. Lots of records are there for our research.